It comes in two standard fabrics (“lychee” and “tiger lily”) for $1680 but can also be customized – at a price within the ‘if you have to ask’ range. But compare this to the thousand-plus bucks you could be spending on a fancy crib or a Nurseryworks rocking chair and the price becomes less crazy. Plus, wouldn’t it just make you so happy to see it everyday? (remember, slight feelings of guilt for spending a mortgage payment on a chair are totally natural and sometimes a necessary side effect). If not, we’ll bring you back to reality. But we’ll bring you down softly. 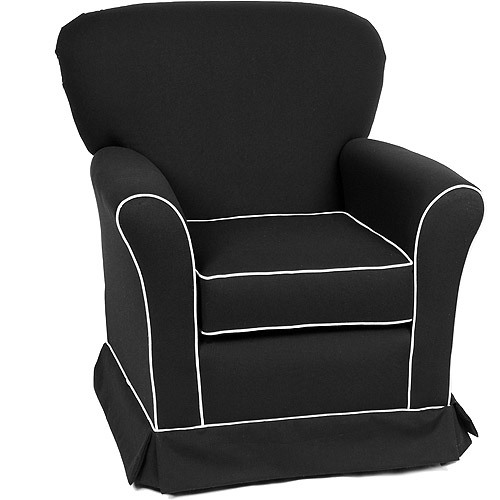 The IKEA Poang chair has become a basic by now, like a pair of (non-designer) jeans – functional, useful, perfectly pleasant, but unlikely to stir any sort of complex emotions in your household. Well, good news. I spied two new fabric coverings upon my last visit to the Swedish mega-emporium that made me smile. At top, Tuna (I have no idea why it’s called that). And below, a woodland-themed design called Karlsro Multi. I could envision an entire nursery designed around this pattern. At $129, it’s virtually palpitation-free, but smile-inducing, nonetheless. Received a comment today from a reader that mysteriously disappeared (sorry!) but not before I could read and seek a response. Apparently, the prices I quoted for the gliders from the Posh Tots website no longer apply. I returned to the site today and noticed that the sale prices were gone. But I’ve contacted Customer Service and have asked them to clarify – whether it was a one-time deal or if the sale prices will be returning. I’m looking forward to hearing from them and I’ll let everyone know when I get a response. UPDATE: Received a lovely response from PT and updated the Glider post to reflect non-sale prices (Unfortunately, it was a March promotion and is now finished). But to save anyone reading this from the confusion I faced, I’ve done a roundup of my favorite gliders by a very well-reviewed company named Little Castle. What I’ve learned (through my experience with BabyMod/Walmart, AKA Million Dollar Baby) is that it’s now common practice for manufacturers to sell incredibly similar products under different names across different price points. (It’s similar to Converse One Stars being sold exclusively through Target). Interestingly, when the more expensive lines go on sale, they all become very comparable. So rather than organizing the following gliders by price, I’ve listed them by dimensions, from narrowest to widest. In my personal experience, making sure the chair actually fit in my room was the most important consideration! But what you’ll find is that price actually correlates more with chair depth than chair width (the deeper the chair, the more cushy it is, I suppose). But please take these prices with a grain of salt — when you customize fabrics, the prices will go up. (I’d also normally offer a broader range of retailers as well, but this time I found the best deals on the Posh Tots site). But if you’re in the market, I’d always double-check Rosenberry Rooms , CSN Sofas and Just Nursery Gliders (it’s a real site) to be sure. PoshTots typically offers a 20% off glider sale twice a year, so your readers can look forward to another sale in the fall. 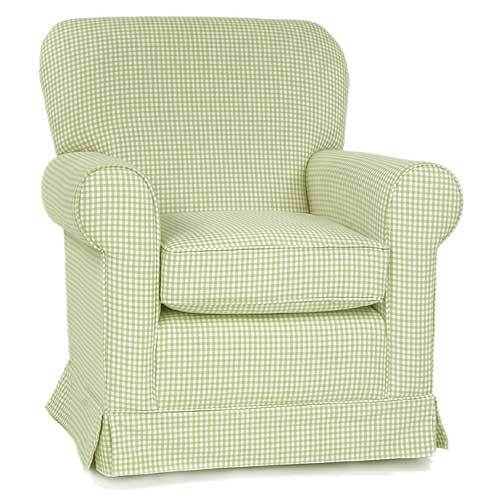 Until then, there are several PoshTots coupons that can be found online, including CJ750, the most popular ($100 off orders of $750 or more) that could be used on a glider order or with a more affordable glider and ottoman. 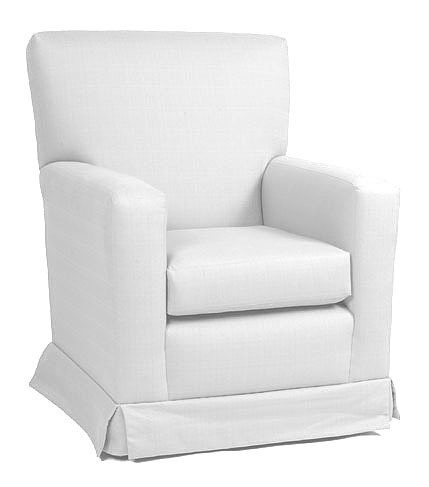 Measuring 31W x 35D x 37H, the Venice is on the short end (chair backs range from 37″ to 40″ high). If you’re on the taller side, you want to be sure that you’ll be able to fall asleep sitting up (when nursing at 3AM, for instance). But the depth is such that I’d bet you’d be really comfortable, regardless. 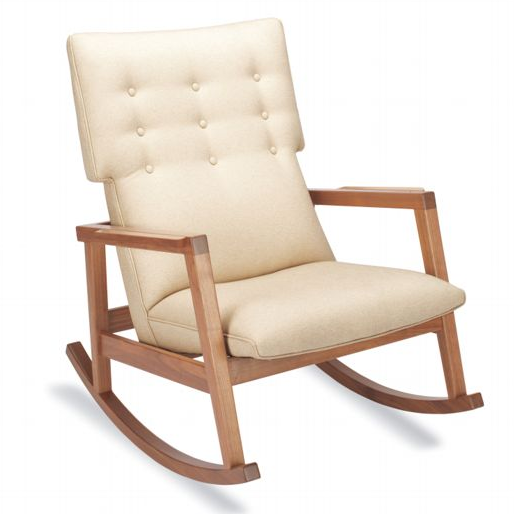 Color selection is very limited, but I love the white piping available on the brown chair (and ottoman) as shown. The Rage measures at 31W x 33.5D x 37H. It’s smallish, but incredibly streamlined, without the back cushion like the Venice. If you’re looking for an unassuming, basic glider, this is it. At 32W x 36D x 38H, this chair is deeper than the Venice (at top). But these measurements are slightly misleading, as both feature a cushion back. It’s listed as Verdi Jou Jou on Posh Tots but is clearly marked on the Little Castle website as Riviera. The Chateau is 33W x 33D x 40H. The rounded arms take up much of the width. 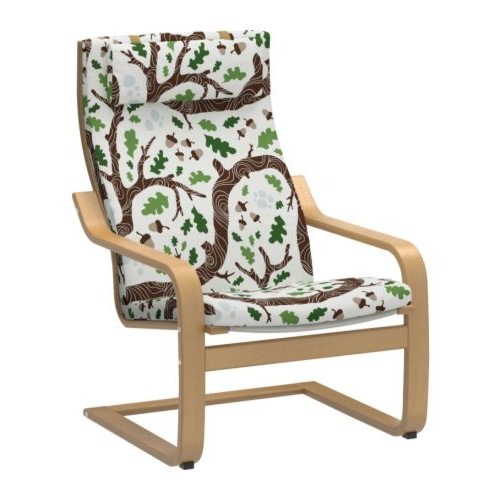 I don’t know if it’s because of the fabric shown above, but I love this chair. It’s much more traditional than I’m used to but I think it could serve as a beautiful contrast in a modern room. 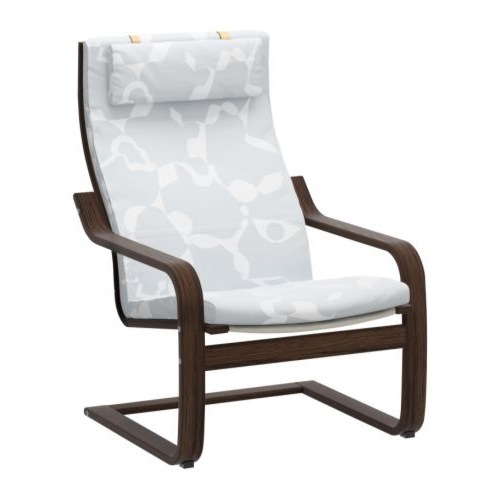 At 33W x 31D x 39H, this is the deal of the day. I’m not wildly crazy about the rounded back cushion but at nearly $200 less, I think I’d grow to like it. 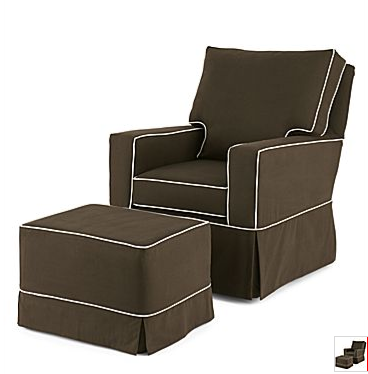 This chair is exactly what I was talking about. I have read nothing to suggest that the quality of fabric or manufacturing here is any lower than the Little Castle-branded items elsewhere. The Heritage measures at 34W x 30D x 39H, which means it’s pretty big. 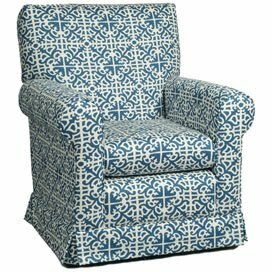 And the prices are all over the place for this piece — they’re highly dependent on fabric selection. So if you’re flexible, you can get a great deal. And please shop around for the best price. 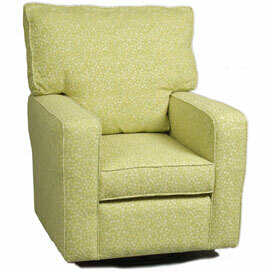 34W x 38D (removable cushion) x 38H. Huge. But somehow fitting. I love this toile fabric. 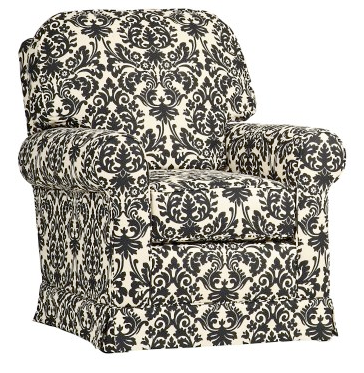 If you have room, and want to make a statement, this is the chair to buy. 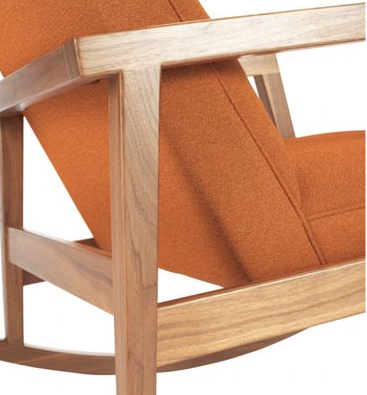 I’ll do a similar roundup of other favorite rocker/gliders, and I can’t wait to feature Monte Designs (home of Fionn’s orange chair – see it here).